With two bases in West Yorkshire, one in North Yorkshire, one in Cheshire and one in Oxfordshire, we are ideally placed for a day out or a weekend touring beautiful countryside in some of the most scenic regions of the United Kingdom. Our Yorkshire bases – Keighley, North Leeds and Ampleforth – are only a stone’s throw away from Skipton, Bolton Abbey and the outstanding scenery of the Yorkshire Dales and the North Yorkshire Moors. 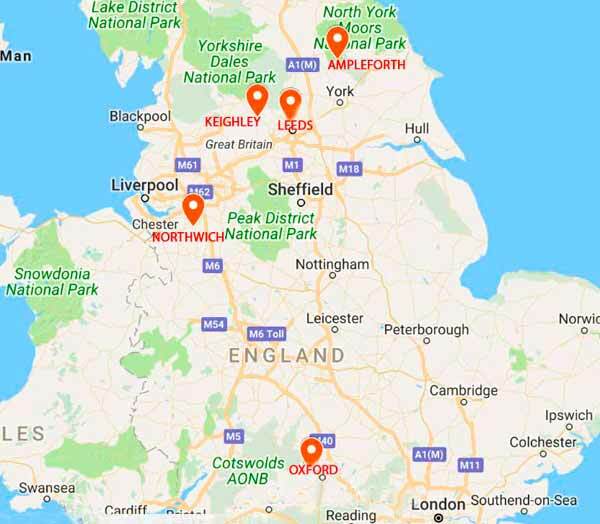 Our Northwich, Cheshire base is within easy driving distance of the Derbyshire Peak District and North Wales coast. Our Whitney, Oxfordshire base couldn’t be better placed for tours of the rolling hills and picturesque villages of the Cotswolds. Contact us now for classic car hire gift vouchers or to find out more about our classic car hire services. Special arrangements may be made to pick up or return the car outside these hours, subject to availability. Please enquire. Classic Car Hire North has four bases in the north of England near to Leeds, Harrogate, York, Sheffield, Manchester, Liverpool and Hull. We also have a base in Oxford, within easy reach of the Midlands and North London. We are well placed in respect of both road and rail networks, making us the ideal location for anyone wanting to hire a classic car or sports car for use anywhere in Yorkshire, the North West of England, Lancashire, the Lake District, Derbyshire, Warwickshire, Oxfordshire or Wiltshire. Just north of the M62, our Yorkshire bases are only about 25 minutes drive away from the motorway network that connects Yorkshire to Birmingham, London and the North East. Just west of the M6, our Cheshire base is very close to the M6 motorway linking the Midlands to Scotland. Our Oxfordshire base is just west of the M40 connecting London, Oxford and Birmingham., and just north of the M4 which links London, Reading and South Wales. Our base in Keighley, West Yorkshire, is a stone’s throw from Haworth, Bronte Country and the beautiful Yorkshire Dales. It is also within easy reach of the outstanding scenery of the Lake District. We are 10 mins walk from the railway station at Keighley. From Keighley it’s only a 30 minute journey to Leeds or Bradford, from where you can catch a connection to most other major UK cities. The journey time from Keighley to London is just over 3 hours. Our base in Leeds is close to the Yorkshire Dales and within easy reach of Harrogate, York, the North York Moors and the east coast of Yorkshire. If you are unsure of the best way of getting to us, please call and we can advise you.